It's time to move on to our next project and this one is completely different than anything we've done before. It's a duplex. Built in 1928, it appears to have always been a 2 family home. And it's a big duplex. 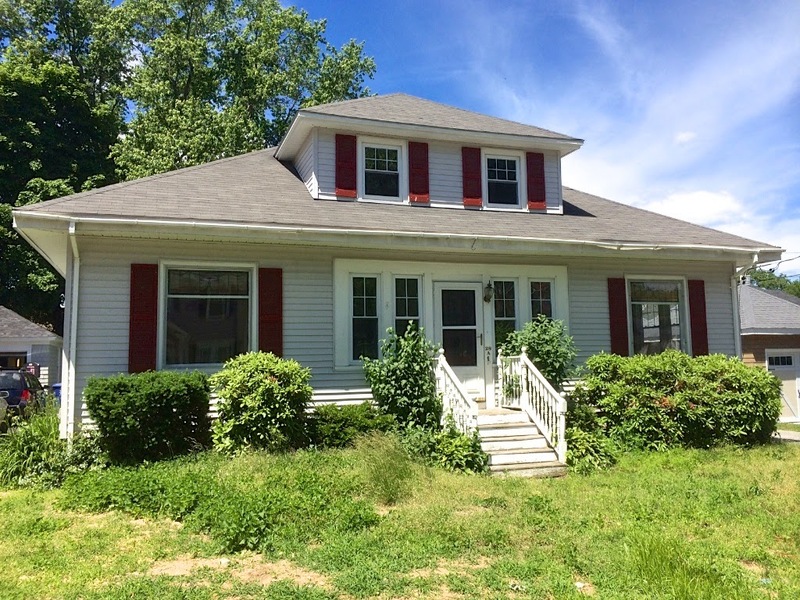 It has almost 2,500 square feet with 4 bedrooms/2 baths on one side and 3 bedrooms/1 bath on the other. I'm pretty excited about this house. My husband Richard.....maybe not so excited. As he put it, he's not sure he has the stomach for some of the challenges :-) Thankfully the rest of the team is as enthusiastic as I am. This house was in foreclosure. So that means when you go to look at it, it has no power and no water. Kind of creepy, actually. The flashlight app on my phone got quite a workout as we peered around! And that might be one reason Richard didn't want to hang around. First challenge - the staircase to nowhere. Surely it used to go down to the ground, but we can't find any clear evidence of it now. Obviously, we're going to need to fix that! 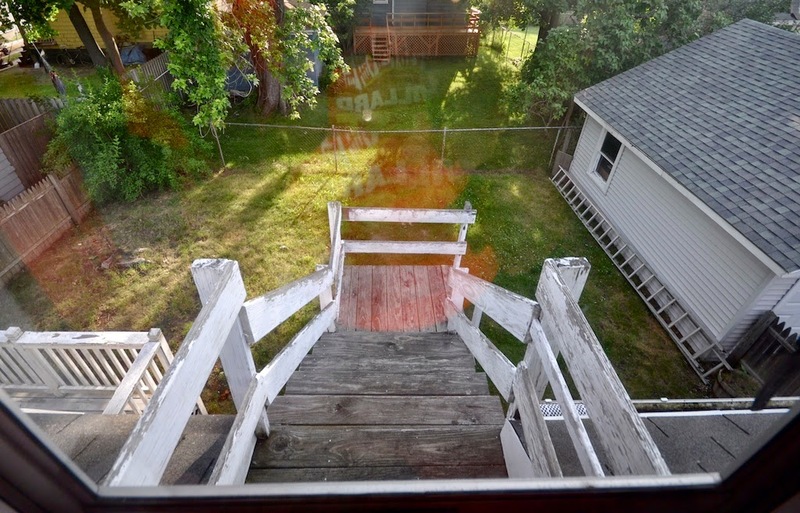 I'm thinking a small second floor deck might be nicer than taking up a big chunk of the backyard with a staircase. What do you think? 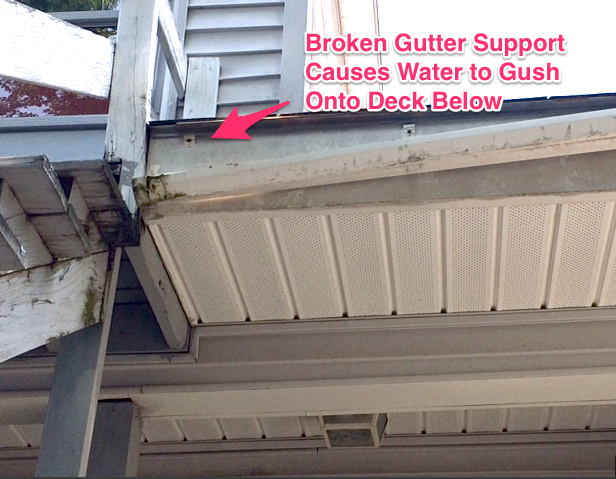 Second challenge - See what happens when gutters don't work right and water pummels a deck for a long time? 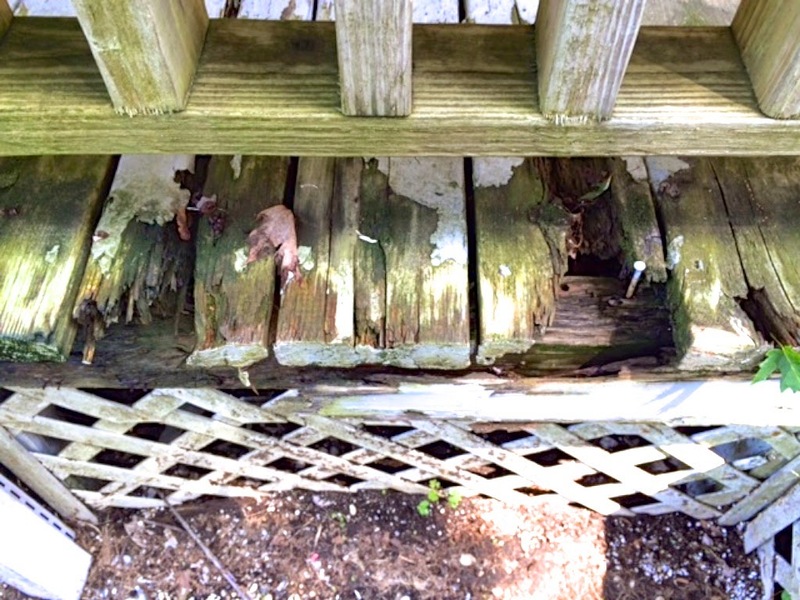 We're going to have to replace most of this decking. And I think we might find some carpenter ants (who love wet wood) in there as well. This gave us all a good laugh! 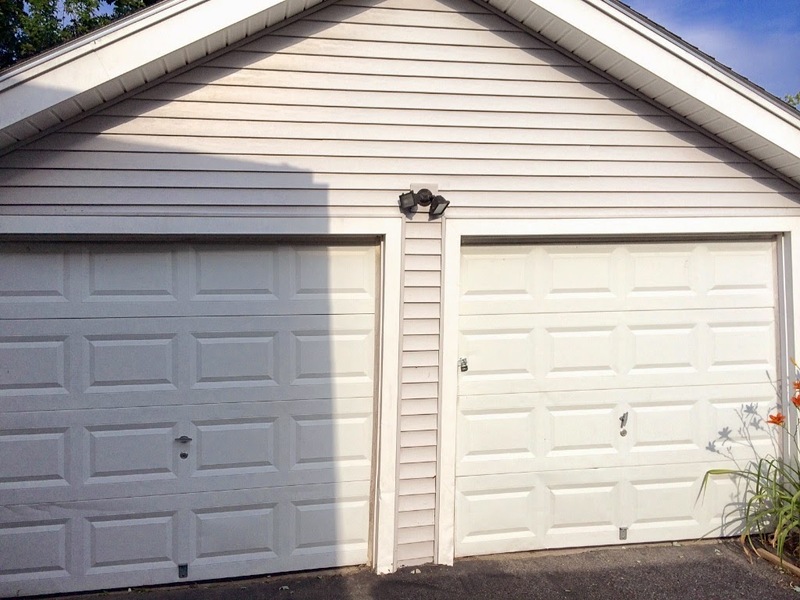 Third challenge - Hmmm.....doesn't that garage appear to be leaning? And some of the internal structure has been compromised. 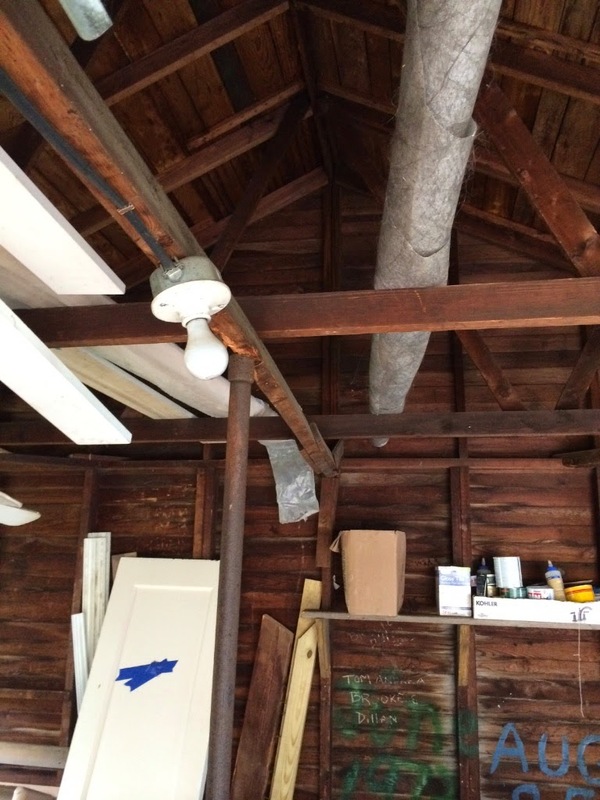 How do you like the twisted/rotting 2x4 holding up the rafters? 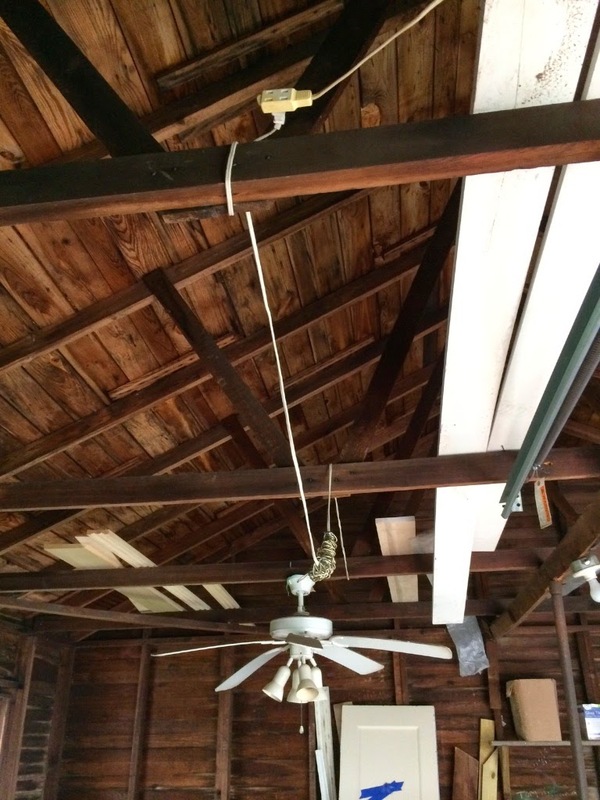 Or how about how they mounted the ceiling fan? We thought that was pretty entertaining! We need to do some structural reinforcement. I don't want to store anything in there until we get it strengthened. That's a shaky looking 2x4 support! We've also got a few broken windows, a front railing that wiggles (a lot), and missing gutters. But there is some good news as well! The siding is in nice shape and the roof looks pretty good. And a feature I really love - this front entrance. Isn't it cool? The front door to each unit is on either side of this entrance. 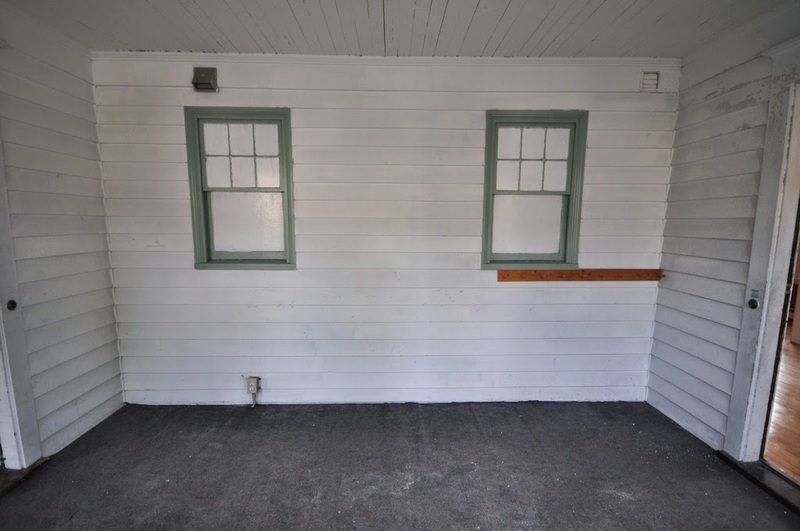 Why, you ask, are the window panes painted white? They are on the back of shower units, so I'm planning to tear them out and create a mud bench & closet for each unit. This should be a fun project. I hope you'll enjoy following along! Want to see more pics? Check them out here (Owners Unit) and here (Tenants Unit). And as always, be sure an 'Like' us on Facebook to see even more photos and updates. Oh, I'm so excited to watch your progress on this one! Please tell Richard that his stomach is in my prayers. :-) Your post reads as though you are keeping it as a duplex - does that mean you can sell it to two different buyers if you wanted to? We haven't figured out exactly what we'll do when it's finished. A lot of people are creating condos out of units like this. We'll just figure it out as we go along! And I bet you'll have fun with the figuring. I admire the way you and your team take the bad in stride and change it into better - it's inspiring. If you plan on renting I would scrap the second floor deck. From a tenant it would be neat, but on the landlord side why give yourself the headache of extra insurance because of the liability of it. Hmmm.....I guess I'll need to look into that. At this point, the insurance company has insured us - and the staircase is just hanging there! 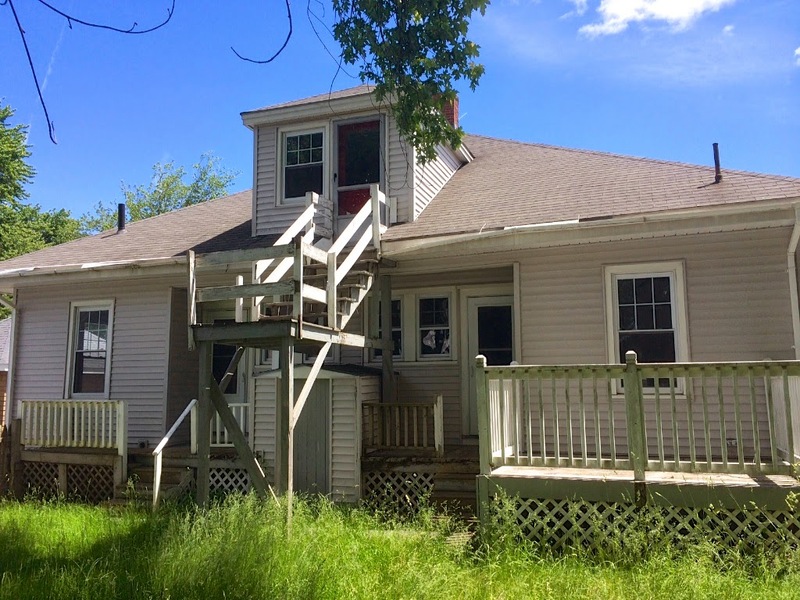 We looked at a home that we were going to make into a rental cottage/hunting lodge or purchase to flip. In the end we decided not to persue. LOTS of issues that looked like the movie "Money Pit". We'll watch your progress on this instead ;-) Can't wait to see how it shapes up. Put up interior pics soon please. My parents own the house behind this one - that's our blue garage next to you (it's pretty slanted too...)! So happy to see it was purchased by you guys, it deserves a nice renovation. Looking forward to following the progress! Ashley that is so cool!!! And their house is lovely. Hopefully this one will be much nicer for them to look at soon!